Inscribed on the asset register of World Heritage sites in 1994…but how much has been wiped out by October’s bushfires? ..then the wind picked up…unbelievable! Over the past month, a single contiguous area covering some 60,000 hectares of vegetation has been left to burn by bushfire. 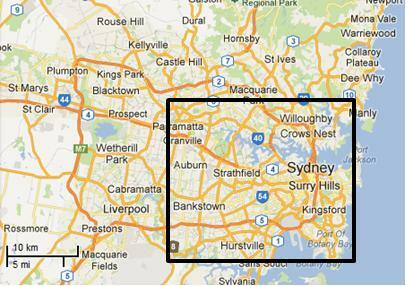 That equates to 600 km2 or roughly 25km x 25km. Much of what has been burned is/was of World Heritage values within the included Oxley Wild Rivers National Park. This is unacceptable custodial neglect. – such would historically dwarf the Great Fire of London. The Rural Fire Service has labelled the bushfire the ‘Macleay River Fire‘. But it began as two separate bushfires on or before 12 October, nearly a month prior. One was then labelled ‘Georges Junction Fire‘ and the other ‘Freds Creek Fire‘, both purportedly ignited by bush arsonist(s). Seven days later, the Georges Junction Fire has burnt an estimated 8,931 ha, while the then much smaller Freds Creek Fire had burnt 1,688 ha. By the time the combined bushfire was extinguished 60,000 hectares had been burned, much within the World Heritage Area.. This is yet another classic case of bushfire neglect primarily by the delegated custodians of the National Park and World Heritage Area – the New South Wales National Parks and Wildlife Service. Is this due to chronic lack of resourcing; and/or symptomatic of a disturbing rationalist culture that believes that burning Australian vegetation, even ancient rainforest, could be somehow beneficial to biodiversity. Remote ignitions go undetected, then unsuppressed, until many days later, bushfire weather conditions worsen and the fires get out of control, combine and destroy vast areas of important Nationl Park and World Heritage. This 2012 Macleay River Fire is like the ‘2006 Grose Valley Fires‘ of the Blue Mountains repeated to script. The Australian Government continues to be ultimately culpable for gross neglect in failing to protect its custodial listed natural heritage. The Rural Fire Service has learnt to avoid accusatioins of incompetence by routinely removing timely records on its websites about the operational response in the days at the start of the ignitions. Details about the timings of ignition detection and initial suppression are deliberately withheld from the public. The following bushfire updates are mainly from second-hand news media. A notable recurring theme across these news reports is that the media interest and the target of the fire fighting effort, just like in urban fire fighting, is to save humans lives and property. This is not a bad thing, but the glaring omission is the lack of interest in suppressing the bushfire in the National Park and World Heritage. The Rural Fire Service policy and operational strategy is such that if human lives and properrty are not directly threatened by bushfire, then a bushfire is allowed to continue burning, irrespective of whether it is burning through National Park or World Heritage. Since the Rural Fire Service has the same terms of reference as the professionaly paid New South Wales Fire Brigade, then they are essentially doing the same urban job. The only reason the Rural Fire Service exists in less populated rural areas instead of the professionaly paid New South Wales Fire Brigade, is traditionally so that the Australian Government and New South Wales Government can save money by relying on unpaid, under-resourced volunteers. Yet the environment in rural fire fighters work in is inherently more dangerous, demanding and in need of sophisticated resources for military-speed detection and suppressions of bushfires. Having already burnt out a massive 14,000 hectares and is likely to join up with the Freds Creek fire. The active edge of the fire shows up bright yellow; the red areas are the burnt areas. <<Two massive bushfires in the Oxley Wild Rivers National Park were basically running unchecked yesterday because of adverse firefighting conditions, incident controller for the New England bushfire emergency, Allyn Purkiss, said. Mr Purkiss said the two Section 44-declared fires one named Freds Creek and the other Georges Junction were likely to join up yesterday and burn out a total of 30,000 hectares in the coming weeks. “They took a big run under strong winds (on Saturday)..The fires had started after landholder burns had got away”, Mr Purkiss said. ..The fire named Freds Creek, which started on October 12, had burnt out 3,189 hectares and was crowning at 4am yesterday, with flames jumping from treetop to treetop. “It means it’s very uncontrollable very dangerous conditions,” Mr Purkiss said yesterday. The RFS had been unable to aerial-bomb the fires because of gusty winds. Mr Purkiss described it as “nigh-on impossible” to water-bomb in those conditions. Instead, RFS volunteers had concentrated on saving property. He said it was hard to tell how many homes and remote-area shacks might be affected. “We’re still trying to come to terms with that. We could have up to 50 in the area: there are shacks all through this country,” he said. Mr Purkiss said the other fire, Georges Junction, had already burnt out 14,000 hectares. (Ed: Same as the 2006 Grose Valley Fires). He said conditions in the New England RFS zone were “fairly similar” to strong, gusty winds on Saturday. “The forecast is for 50km/h winds by late afternoon,” Mr Purkiss said. No homes had been lost in either fire yet. “None that we know of,” he said. The RFS was doing a “fairly extensive reconnaissance of the area”, he said. Three other fires one about 40km east of Guyra, one near Walcha and one near Ebor had also started since Friday. The Guyra fire, which started on Saturday, was located in the Mt Mulligan/Wards Mistake area. Locals had alerted the RFS to the fire, which was in “very remote country … it’s difficult to get to no roads, no trails”, Mr Purkiss said. “I’ve tasked an aircraft to get out there today and map it and give us some intel (intelligence),” he said..
Mr Purkiss said he was “not sure” how much land had been burnt out he would have to wait for information provided by the aircraft crew. 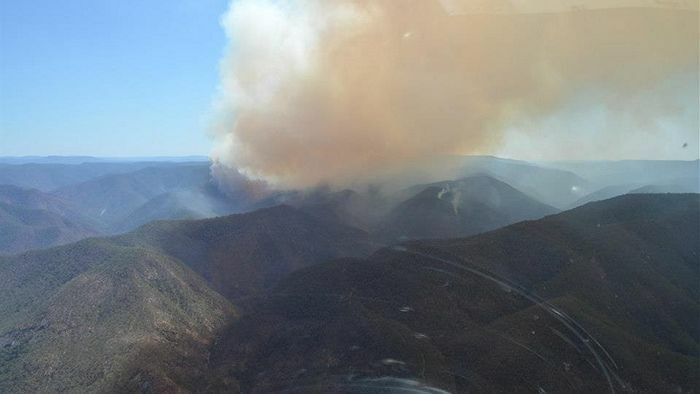 The Walcha fire, called Panhandle and in the Enfield State Forest, had burnt out five hectares by the time it was contained by mid-afternoon on Saturday. The Ebor-area fire was located “in an area we can’t get to”, Mr Purkiss said. “We’re flying to map it today,” he said yesterday. It had also burnt out five hectares. “Local landholders and Ebor RFS assisted in containing it,” he said. Mr Purkiss said the New England RFS zone was unlikely to lift its suspension of fire permits today. “While ever we have a bushfire emergency like this going, all permits are suspended we’re already dealing with enough fires, so we don’t need any more mistakes giving us grief than we already have,” he said. Mr Purkiss said this season had already started to play out differently compared to the past three years. In the past three fire seasons, rain had usually come along and helped extinguish any fires but this season was different, with many more periods of extended dry weather. <<Fire continues to threaten properties near Oxley Wild Rivers National Park after two blazes combined yesterday. The Macleay River bushfire had already burnt about 20,000 hectares early yesterday afternoon as more than 30 firefighters battled the out of control blaze, NSW Rural Fire Service spokeswoman Bridie O’Connor said. The inferno may have posed a threat to properties between Georges Junction and Five Day Creek, particularly on the Carrai and Fitzroy Tablelands and on the Macleay River in the vicinity of Lower Creek and Comara, Ms O’Connor said early yesterday afternoon. Hot and windy conditions over the weekend (20th and 21st) saw the fires at Georges Junction and Freds Creek combine. The Georges Junction fire, near Cochrane State Forest, which started on October 12 had burnt more than 14,859 hectares and was still burning out of control when it met with the Freds Creek fire early yesterday afternoon. The fire at Freds Creek was being controlled yesterday afternoon after three State Forest groups joined the NSW Rural Fire Service to use bulldozers to create fire breaks earlier in the week. Meanwhile, the Armidale to Kempsey Road between Waterfall Way and Bellbrook was closed on Saturday and Sunday because of the fires. The Rural Fire Service was concentrating its efforts on establishing containment lines. 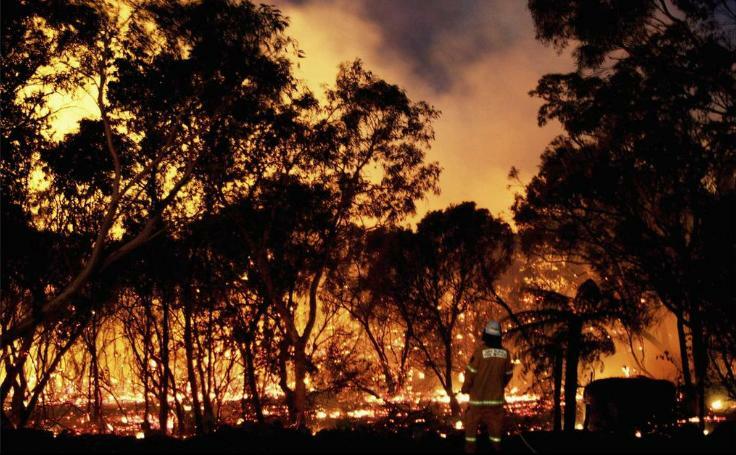 <<…Adverse weather conditions on Sunday hindered attempts to subdue two massive bushfires in the Oxley Wild Rivers National Park. Fire crews were reduced to protecting property on the ground and the two fires merged late on Sunday as fire crews battled from the ground to protect property, unable to water bomb due to gusty winds across the region. The fire, now named the Macleay River Fire had burnt out 28,733 hectares as of last night, Inspector Brett Loughlin, public liaison officer for Armidale Section 44 with the NSW Rural Fire Service, said. Mr Loughlin was expecting the fire to burn out more land. “We’re doing some mapping now and expect it to be around that 30,000-hectare mark,” he said. He said 52 firefighters were on the ground creating firebreaks, doing backburning and helping protect the property of landholders living within a few kilometres of the fire front. “There are properties in close proximity,” Mr Loughlin said. “The fire has flared up a little this afternoon and some embers are falling around properties in the Lower Creek area. Five helicopters are currently tasked to water bombing the Macleay River Fire. <<Rural Fire Service forensic investigators have interviewed a ‘person of interest’ as the battle to contain the Macleay River fire enters its 15th day. RFS investigators from Kempsey and Coffs Harbour arrived yesterday to investigate the possible cause of the blaze in the Oxley Wild Rivers National Park which has since burnt out 33,160 hectares of bush and pasture land. RFS Public Liason Officer Inspector Brett Loughlin said all major fires were investigated as a matter of cause and investigations were ongoing. Around 80 firefighters from the NSW RFS, FRNSW and NPWS, supported by five aircraft and four bulldozers are fighting the fire, which has a 247 kilometre perimeter. Ember attack on properties around the Lower Creek area were reported yesterday but Inspector Loughlin said that firefighters were working with local landholders to protect at-risk homes. Inspector Loughlin said that good containment lines had been established by fire crews in the last 24 hours and today “aerial incendiary” work by helicopter would be carried out on the south western side of the blaze. “It’s still an active fire but we’re starting to get a handle on it,” Inspector Loughlin said. The Macleay River Fire is the culmination of the ‘Freds Creek Bushfire‘ and ‘Georges Junction Bushfire‘ that had merged last weekend. The fire is burning in the vicinity of the Comara, Georges Junction, Five Day Creek, Lower Creek, Blanches Creek and Smith Creek areas. <<Three local government areas have been declared natural disaster zones in the wake of a major fire that has been raging in northern NSW for two weeks. “These fires have been burning in the area for a number of days and due to the conditions, they merged into one large fire, jumped containment lines and threatened numerous properties,” Emergency Services Minister Michael Gallacher said in a statement on Monday. Over the last two weeks, bushfires have raged across the New England and Mid North Coast regions. Other fires under this declaration include the Clay fire in Armidale Dumaresq, the Panhandle fire in Walcha and the Mulligans fire in Guyra on the western side of Guy Fawkes National Park, which has burnt over 3,400 hectares of National Park and private land. Mr Gallacher said the Macleay River fire had damaged significant portions of the Oxley Wild Rivers National Park, which is part of the Gondwana Rainforests of Australia World Heritage Area, a series of protected areas which were first inscribed on the World Heritage List in 1986 and extended in 1994. <<Three separate fires burning out of control south-west of Casino since the weekend have been contained, the Clarence Valley Rural Fire District reports. The ‘Dubadar Creek Bushfire‘, which was believed to have been started by arsonists before blowing out from 50ha to 300ha on Saturday, was contained on Sunday and was extinguished at midday today, the district’s incident controller Stuart Watts said. Two separate blazes, also deliberately lit, at Mt Pickabooba 4km from the Dubadar Creek fire were expected to be contained by this afternoon following back-burning, Mr Watts said. The Rural Fire Service had 10 fire trucks, 19 personnel and two bulldozers working to bring the fires under control on the weekend. The Northern Star has approached the police for comment. The battle with the blazes come as NSW Police and Emergency Services Minister Michael Gallacher declared natural disasters for the Mid North Coast – parts of which only a year ago were receiving the same declaration for floods – and New England areas. “The main focus of this declaration is the Macleay River Fire, which developed on 21 October 2012 as the culmination of the Fred’s Creek and Georges Junction Fires,” Mr Gallacher said in a written statement. “These fires have been burning in the area for a number of days and due to the conditions, they merged into one large fire, jumped containment lines and threatened numerous properties…Firefighters have been working hard to create containment lines around the Macleay River Fire to protect properties as the fire approaches. “As of 1 November 2012, the Macleay River Fire continues to burn and is estimated to have damaged over 51,000 hectares of National Parks, State Forests and private land across the three LGA’s of Armidale Dumaresq, Walcha and Kempsey. <<When is our judicial system going to get serious about arsonists? It is difficult enough to catch them. Think about what they do. 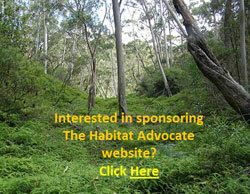 They destroy natural bushland and animal habitat. They put the lives of people at risk or even cause deaths. They destroy property which causes hardship and suffering and years to rebuild. This pushes up everyone’s insurance premiums. They out emergency services personnel at risk. 1986: Gondwana Rainforests of Australia inscribed on the World Heritage List. Over twenty-five years ago, in 1986 the Gondwana Rainforests of Australia, then called the Central Eastern Rainforest Reserves of Australia (CERRA), were inscribed on the World Heritage List for their outstanding natural universal values. The Gondwana Rainforests of Australia is a serial property comprising the major remaining areas of rainforest in southeast Queensland and northeast New South Wales. They include the most extensive areas of subtropical rainforest in the world, large areas of warm temperate rainforest and nearly all of the Antarctic beech cool temperate rainforest. Some of the oldest elements of the world’s ferns and conifers are found here and there is a concentration of primitive plant families that are direct links with the birth and spread of flowering plants over 100 million years ago. A wide range of plant and animal lineages and communities with ancient origins in Gondwana, many of which are restricted largely or entirely to the Gondwana Rainforests, survive in this collection of reserves. 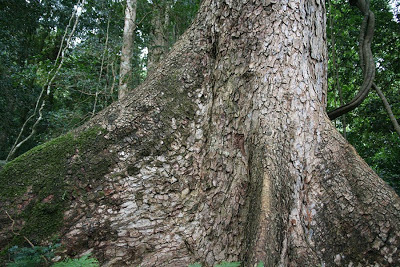 The Gondwana Rainforests also provides the principal habitat for many threatened species of plants and animals. The area is one of the best places on earth to see ancient ferns and Araucaria such as Hoop Pines. Found naturally in the dry rainforests of New South Wales and Queensland and in Papua New Guinea. The trees can live up to 450 years and grow to a height of 60 m.
Rainforest once covered most of the ancient southern supercontinent Gondwana and remains the most ancient type of vegetation in Australia. The Gondwana Rainforests provide an interesting living link with the evolution of Australia. Few places on earth contain so many plants and animals which remain relatively unchanged from their ancestors in the fossil record. Due to two centuries of colonial deforestation across New South Wales and Queensland – timbergetting, ‘land clearing’ for agriculture and housing – the reserves of rainforest that comprise The Gondwana Rainforests in discontinuous patches, surrounded by fireprone eucalypt forest and cleared agricultural lands. These patches range in size from tiny gully stands to lush forests covering large valleys and ranges. Collectively, these ‘serial sites’ despite their small size and scattered fragments, provide proximity and interconnection by corridors of semi-natural habitats and buffers. Their natural asset value is fragile and demands intensive management and protection in order to preserve their ecological integrity. The ecosystems of the Gondwana Rainforests contain significant and important natural habitats for species of conservation significance (World Heritage Natural Criterion x). The Gondwana Rainforests provides the principal habitat for many species of plants and animals of outstanding universal value, including more than 270 threatened species as well as relict and primitive taxa. Many of the rare and threatened flora and fauna species are rainforest specialists, and their vulnerability to extinction is due to a variety of factors including the rarity of their rainforest habitat. The Gondwana Rainforests also protects large areas of other vegetation including a diverse range of heaths, rocky outcrop communities, forests and woodlands. These communities have a high diversity of plants and animals that add greatly to the value of the Gondwana Rainforests as habitat for rare, threatened and endemic species. The complex dynamics between rainforests and tall open forest particularly demonstrates the close evolutionary and ecological links between these communities. Endemic to rainforests and sclerophyll forests in New South Wales from the Watagan Mountains in the South to the Gibraltar Range in the North. 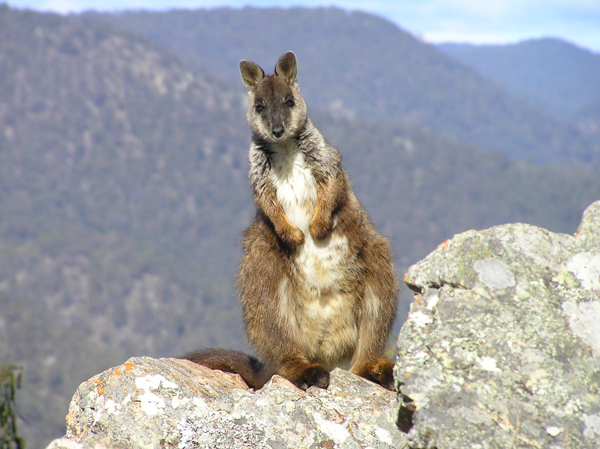 Parma wallabies were thought to have become extinct a century ago until being discovered again in the 1970s. In 1994, large extensions of rainforests across south-east Queensland and New South Wales including the Oxley Wild Rivers National Park were added to the World Heritage listed Central Eastern Rainforest Reserves of Australia (CERRA), now entitled The Gondwana Rainforests of Australia (since 2007). These reserves comprise almost 50 separate remnant reserves of unspoilt rainforest wilderness stretching from north-east New South Wales (the Oxley Rivers region) up through south-east Queensland. Each of these reserves contains important nature conservation values in its own right, however the full significance of the property becomes evident only when viewed as a whole, and collectively CERRA provides a significant network of habitats for many of Australia’s rare and endangered species. Since 1994, the Australian Government in co-operation with both the New South Wales and Queensland Governments have recognised the need for coordinated, consistent and cooperative management, to ensure that the integrity of CERRA‘s values is protected. 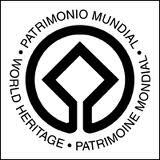 At the time, the World Heritage Committee requested the Australian Government complete management plans of individual sites. 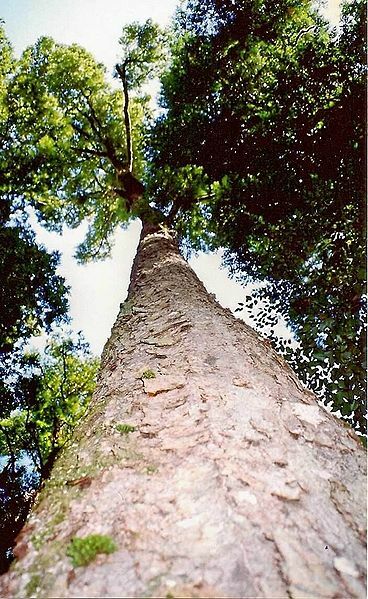 Six years later in 2000, the Australian Government published its ‘Strategic Overview for Management for the Central Eastern Rainforest Reserves of Australia to guide co-operative management by the three Governments in relation to the identification, protection, conservation, rehabilitation and presentation of the Gondwana Rainforests. In 2002, a Technical and Scientific Advisory Committee and a Community Advisory Committee were established. The Gondwana Rainforests of Australia are managed principally by the New South Wales National Parks and Wildlife Service (part of the New South Wales Department of Environment and Climate Change) and the Queensland Environmental Protection Agency. Later 1,850 ha of Winterbourne State Forest, also known at the Big Lease, was added to the reserves wilderness. Currently (2012), the remaining 1,560 ha of Winterbourne and 1,075 ha of Enmore State Forests are to be added to the National Park. Further inclusions include Green Gully headwaters and 1,439 ha of leasehold land in the lower Chandlers River gorge. 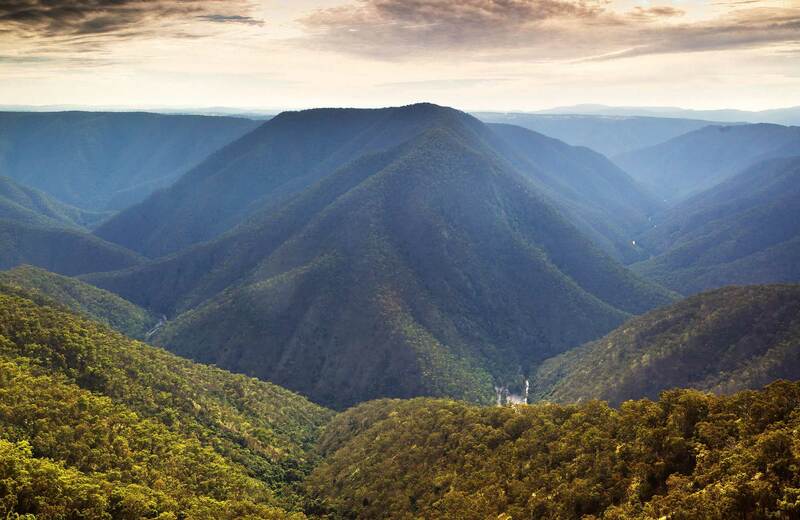 The Macleay Gorges Wilderness Area, covering 50,000 hectares, was declared World Heritage in 1996 and further extended in 1997. In 2007, Macleay Gorges Wilderness Area and Oxley Wild Rivers National Park, along with the 50 separate Crown Land reserves of remnant ancient rainforest were collectively renamed under the umbrella term Gondwana Rainforests of Australia to better reflect their World Heritage values. These include important rainforested areas between Newcastle and Brisbane from Mount Royal National Park and Banrrington Tops National Park to Lamington National Park inland of Queensland’s Gold Coast. High waterfalls crashing into steep gorges are spectacular examples of an important ongoing natural process – erosion. Erosion by coastal rivers created the Great Escarpment and the steep-sided caldera of the Tweed Valley surrounding Mount Warning. This towering mountain was once the buried plug of an ancient vast volcano. Today, rainforest grows on the fertile, well watered soils that remain. The Macleay River on the Mid North Coast of New South Wales, Australia, has the world’s second-fastest flowing currents during flooding, when it can hold over 200,000 gigalitres. Its headwaters flows from the Gara River on the eastern side of the Northern Tablelands near the tonwships of Armidale and Walcha. Key tributaries are the Chandler River, Styx River and Apsley River as well as the Tia River, Dyke River and Yarrowitch River, which pass through a number of spectacular gorges and waterfalls in the Oxley Wild Rivers National Park. The Macleay River flows 400km south-east through Kempsey and into the Pacific Ocean at South West Rocks. Upon colonial discovery in the 1820s; the ancient, tall native Red Cedar (Toona ciliata) forests were completely deforested. In 1976, the Apsley Macleay Gorges were identified as being of ‘true wilderness quality‘. 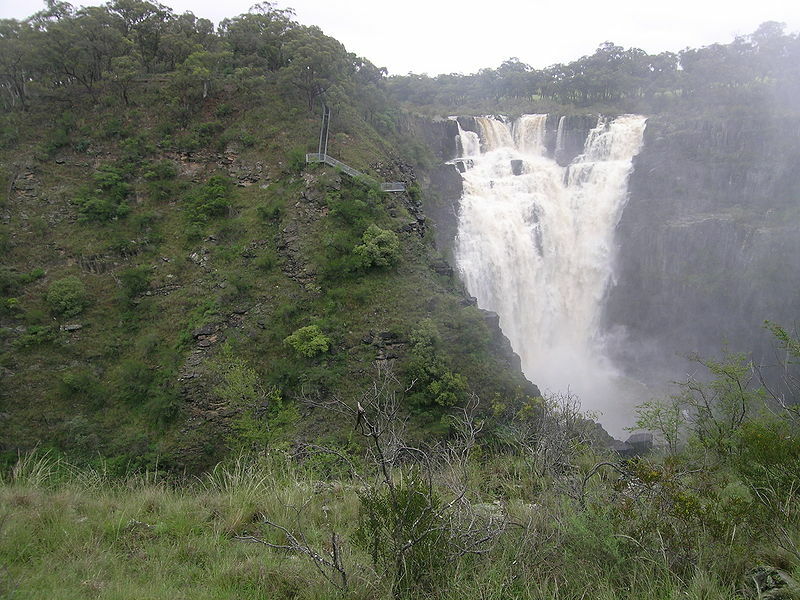 At that stage the public protection offered to the area was limited to two small reserves in the south, and a few local council run recreation areas at popular sites such as Wollomombi Falls, Dangars and Apsley Falls. With future land-use undecided, the NSW Electricity Commission began surveying the Apsley Valley for a hydro-electric scheme in the late 1970s. The Apsley Gorge National Park of 6,718 hectares was gazetted followed by the 3,456 hectare Yarrowitch Gorge National Park soon after. In 1989 East Kunderang Station of 30,400 hectares passed to the National Parks and Wildlife Service (NPWS) and was proclaimed the Oxley Wild Rivers National Park. 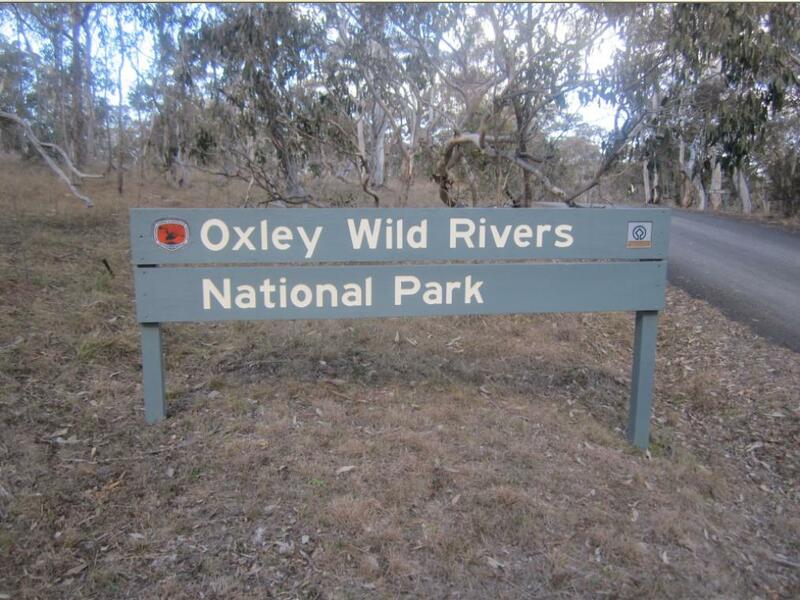 Oxley Wild Rivers National Park is rich in fauna, with over 350 species recorded, including 55 mammals. 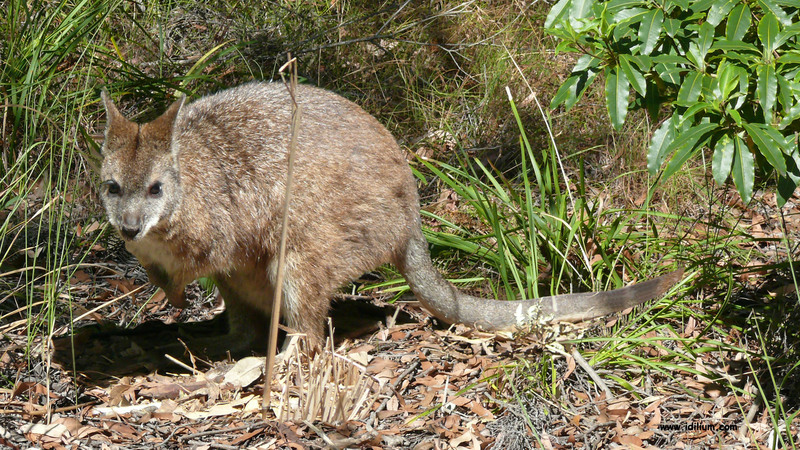 It is a major refuge for the Brush-tailed Rock-wallaby (Petrogale pencillata), with the largest confirmed population in the Green Gully area of Yarrowitch. How many viable individuals have been lost to the Macleay River Bushfire – does the NSW NPWS know or care? Over 173 bird species, 38 reptile and 19 amphibian species have been recorded in Oxley Wild Rivers National Park. Skinks, goannas, tortoises, lizards, snakes, frogs and fish occur in the park, particularly on the river flats. A number of fish species have been recorded. Notable, is the speckled longfin eel (Anguilla reinhardtii), which breeds in the ocean with the juveniles eventually returning to the Apsley–Macleay River system. 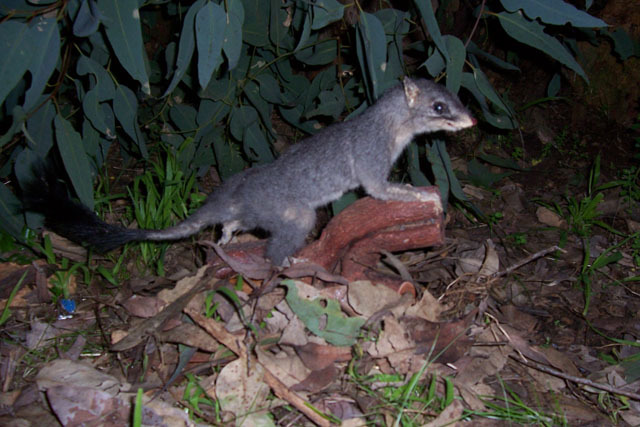 All these wildlife were previously widespread, but now are vulnerable to extinction or worse; which has become an Australian cliché, but at the same time an indictment on Australians. 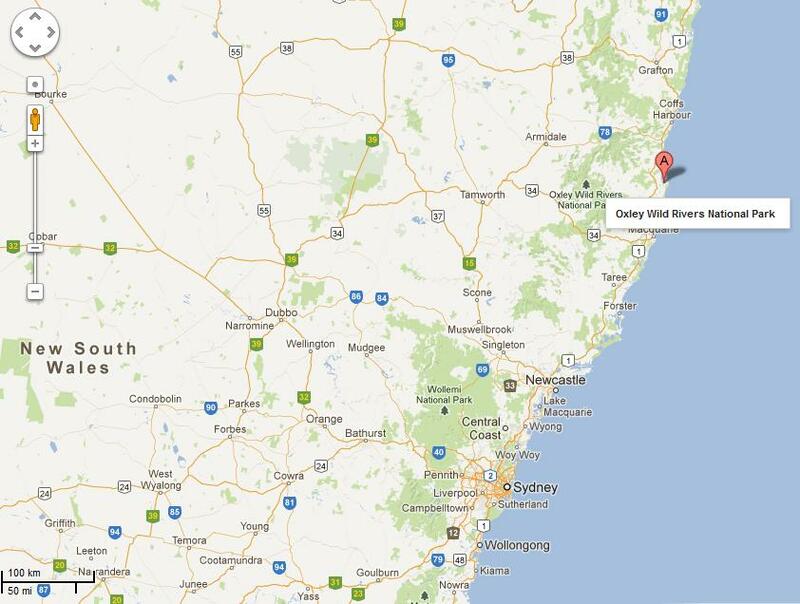 But how much of this protected wilderness region is left after last fortnight’s bushfire catastrophe? How can it be deemed to be protected, when bushfire is allowed to ravage it and its vitally recognised flora and fauna? Was the World Heritage Area allowed to burn as a convenient bushfire management operational defacto Hazard Reduction? There were no human assets at risk. It was wilderness and so out of sight out of mind…such is the dominant bushphobic culture of the Australian and State Governments, so accused of neglect and incompetence after the 2009 Victorian Bushfires that killed 173 people. To current anthropocentric (20th C babyboomer) governments, this ‘Macleay River Fire’, irrespective of its World Heritage ecological protection, is blanketly and culturally dismissed as just another hazardous fuel region to target within Australia’s continent-wide Government Arson strategy. Successive generations will revisit this prevailing cultural mindset of ‘hazard reduction‘ and cast it alongside 19th C ‘timbergetting‘ and 20th C ‘clearfelling‘. In the Blue Mountains, some 40,000 hectares of native vegetation is currently approved by the same Australian and New South Wales Governments for deliberate burning. If deliberately setting fire to the native vegetation is committed privately it is deemed bush arson and so attracts a poultry 14 years gaol or less even less, despite people having been burned to death as a direct consequence. But if deliberately setting fire to the native vegetation is previously prescribed by Government, then participants are artificially deemed legally immune and impune from criminal liability, even if the prescribed bushfires they light get out of control, which is all too frequently. National Heritage is also a matter of national environmental significance under the EPBC Act. The impacts of climate change and high levels of visitation, undertaking effective fire management, and mitigating the effects of invasion by pest species and pathogens present the greatest challenges for the protection and management of Gondwana Rainforests. Climate change will impact particularly on those relict species in restricted habitats at higher altitudes, where particular microclimatic conditions have enabled these species to survive. Management responses include improving the resilience of the property by addressing other threats such as inappropriate fire regimes and invasion by pest species, and trying to increase habitat connectivity across the landscape. 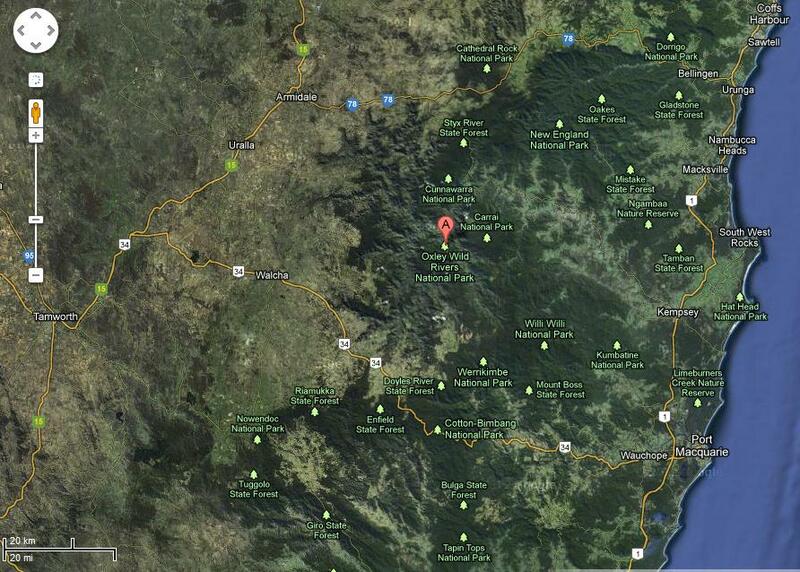 In December 2009, a lightning strike started a bushfire in the Youdales Hut area of the Oxley Wild Rivers region. The hut was unaffected (human property? 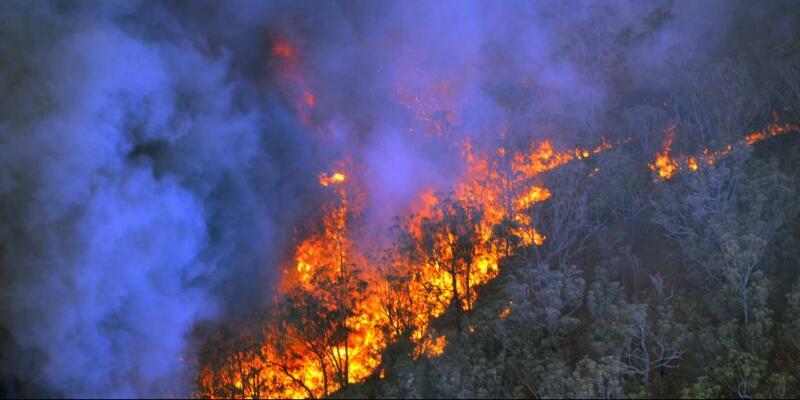 ), but 1,500 hectares of inaccessible steep country was burnt out before it was brought under control. Another lightning strike started a large bushfire in the Reedy Creek region of the park. This fire has burnt out over 8,000 hectares of rough country. This entry was posted on Thursday, November 8th, 2012	and is filed under Kangaroos and Macropods, Threats from Bushfire. Whoever wrote the article on the “unacceptable custodial neglect” in relation to the bush fires in the Oxley Wild Rivers NP, would clearly appear to have little or no idea of how hard NPWS staff work before,during and after fire events like this to prevent the occurrence of out-of-control bush fires. I’d suggest you do some detailed research and talk with some Npws managers before you write misleading articles in the future. The majority of readers and Npws staff for that matter, deserve a little more respect. They put they’re lives at risk attempting (against terrible odds with the weather and the conditions sometimes). Do you? Thank you Andrew (Penni) for your feedback. This article is not about how hard NPWS staff work. Read the article. Listen to the LOCAL firies. When you read this what is your view? I live in Vic , experienced the Black Saturday bushfires and am shocked to read/learn how many planned burns are occuring at the moment and seem to have been for a few years now…When I study the CFA web site , the numbers of areas affected and the amount of land in those areas is often great… so many animals and so much flora being affected…the whole natural world must be in shock in some areas Would you know of any orgs (I have contacted Friends of the Earth already, pls understand) who object to this “planned burns activity” of Victoria and whom I could contact to discuss this with- or is this perhaps something you are involved in with pls? Whilst part of me understands some planned burning my be necessary for the benefit of the environment I have a feeling this current program is extreme and perhaps a knee jerk reaction to the Black Sat fires and it is the poor animals and flora that are paying the price now unfortunately.